A few nights ago I decided to sharpen my knives. 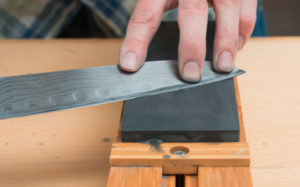 As many of my readers know, I spent some time in a professional kitchen, and there was a time when I did this knife sharpening routine several times a week, and often every day. But now I cook casually at home… so this only happens once a year and usually after I find a blade to be annoyingly dull. I find work like this to be very calming and centering. The hands know what to do, and the mind mostly shuts off. There’s a hypnotic grace to the ritual—to the rhythm of body and hands, and metal on stone. As I worked, I thought a bit about trading and the work we’re doing to help people learn how to be traders. I don’t have a magazine cover-ready photogenic block of shiny, consistent handles. They’re not all the same brand. Some are old. Many are banged up in different ways. But I know them. They work for my hand. They are my knives. And I’ll often cook a meal with just a single knife in hand. In trading, most of us begin looking for the perfect, magical system, the indicator or ratio that will show us exactly what the market will do. 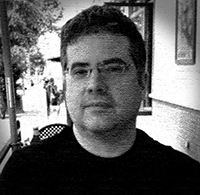 We have systems and screens that layer complexity upon complexity. We think these things will make us profitable. The more experienced trader knows that he or she IS a trader, and that the trading methodology is ultimately just a tool. There’s value in refining and perfecting the tool, but it’s ultimately the hand that holds that tool that determines success. How do you think you start to sharpen a knife? It might surprise you. The first thing I do is draw a sink full of warm water and drop the sharpening stone in so it soaks up water. Then I begin by cleaning each knife—a sprinkle of scouring powder and a vigorous rub with a wet sponge. I think about the things that come naturally to you after you’ve done this a while. If you want to scour a blade and not cut yourself, you must lay the blade flat on the counter and scrub it there. Hold it in the air, and you risk a very bad cut. These little details matter. And so it is in the markets. The little, tiny refinements that seem natural, almost insignificant, can make all the difference between winning and losing. The beginner might search for traders in adverse market conditions while the experienced trader has the patience to wait. The beginner might adjust stops too frequently while the experienced trader just waits. The experienced trader might naturally see things in patterns and relationships that can’t even be explained easily to anyone else, and all of this is natural. Mastery is the assimilation of many small skills at a very deep and natural level. Next, you look at the knife. This seems obvious, but you don’t just pick it up and start sharpening it! You look at it. Has the blade taken a curve that you need to (carefully!) bend out? Is the edge chipped? Is the tip ok?Handle cracked? Any corrosion around the rivets or on the bolster? Any place that needs to be cleaned again? Any scratches from bones that you might want to polish out with some fine sandpaper? How dull is the blade? Any folding damage to the edge? First, you look. You can’t know what to do unless you look. Too many developing traders just rush to put on that first trade. The basics are not complicated, and that’s one reason they are hard. When you are sharpening a knife, of course you look at it first! (But how many people don’t do that…) When you are learning to trade, of course you must think of what your goals are, what your risk tolerance is. Of course you must think about whether your trading plan actually has an edge at all. These are obvious things, but a beginner, left naturally to him or herself, will almost never think of these obvious things. The important things are hidden in plain sight. Then you put the knife on the stone and sharpen. If you watched, you’d think you could do this too. You just see a guy scrubbing a blade across a sharpening stone, but there’s a lot you don’t see. I did this for 10 years without really knowing what I was doing, and then another 10 really working to learn it. You don’t see, at first, that the angle I hold the blade is exactly consistent. It’s held in hands of flesh and bone, but the blade won’t get sharp unless each stroke is machine-like in its consistent precision. You don’t see that I’m carefully gauging the pressure on different parts of the blade so the stone works evenly. You might not see that I give a few extra strokes and pressure on some dull spots I saw when I was looking at the blade. I’m pretty sure you won’t see that the carbon steel blades get a slightly different angle than the stainless. And you might not notice that I sharpen most of them with two bevels to support the cutting edge better. You probably don’t notice that I move my whole body from the legs because I’ve found if I pull with my arms I change the angle on the stone ever-so-slightly over the stroke. The little things matter so much. Anyone can buy an index fund and just forget about it for years, so anyone can be successful in the market. But if you’re going to be trading actively, there are hundreds of small refinements that, collectively, determine your success. You won’t learn them easily and you won’t master them quickly, but, until you do master them, any success you have will be fleeting, at best. After what seems like a very short time, the rhythmic sound of steel on wet stone, I flip the blade over and do the other side. I’m careful to work consistently to shape the blade evenly on both sides. I think about the connection here—this blade is becoming useful because of what I’m removing. It’s an irreparable process; every stroke takes something away from the blade (I wonder briefly if the blade hates the stone that makes it beautiful and useful)—something that can never be returned. Too many little lessons here for trading and to learning to trade… to many to list! But think about that the next time the market hurts you. Taken correctly, the lesson the market just gave you can make you better. Does the blade hate the stone? Then I do something you might think odd: I wash the blade in the water and I touch the edge. I know I can’t really see what I’m looking for, but the fingers feel easily: I stroke the blade just the right way to check for symmetry up and down the edge, and, critically, to feel for a little, tiny, folded burr. That almost-microscopic wire burr tells me I have worked the metal to the point it lost its structural integrity and is ready to take the sharpest edge it can hold. When I look carefully, I can see it in the right light, but I’m amazed at what the fingers can sense when you trust the sense of touch. That wire burr will come off soon, but the failure of the metal tells me I’m almost where I need to be. Next, I flip the stone over and run a few light strokes over the harder side of the stone. Not minutes or hours, just maybe 20 strokes on each side of the blade. I know what this has done. I’ve ripped the wire burr off the edge and left a brilliant, keen edge. I am amazed how little time and pressure it takes to accomplish this if you know what you’re doing. Last, most people would probably hone the blade on a piece of leather. This is, in fact, how you finish a razor blade—polishing to mirror smoothness, but I’ve discovered over the years I want something different from my blades in the kitchen. I want tiny, almost imperceptible teeth on the cutting edge, and the way to get those is to draw the blade a few times through a piece of end grain wood. This allows the blade to find easier purchase on something like a tomato skin, and it only takes 3 or 4 strokes through my old broken piece of a bamboo chopstick to finish the edge. Don’t get me wrong… it’s razor sharp. You can, in fact, easily shave hair off your arm with it, but I don’t want a razor edge. I want the right edge for the kind of work I will do with the tool. Many of us get in the markets, not so much for the wrong reasons, but for reasons we don’t understand. A classic example would be someone who wants the excitement of trading. You can certainly have excitement. You can create a system and approach that will fulfill your dreams in the market—and you will. But are those the right dreams? Are you perfectly aligned with your goals, objectives, and skills? Are you a coherent whole? When you get where you’re going, is it where you want to be? After this knife is done, can you guess what comes next? That’s right: repeat. And again. And again. Though there’s a certain amount of hard-won skill in doing this, it’s really just routine. It only becomes useful when it’s repeated again and again, until all the knives are sharpened. Then I’ll take care of my tools, flatten the stone, let it dry, and put it away until it’s time to do this again. I know this was a different kind of blog post. It asks a bit more of you, the Reader, but there are some important lessons that can help you shape who you are as a trader and move on to the next steps in your trading journey.